The Stihl RE 90 corded-electric pressure washer offers a value-packed electric pressure washer in an easy-to-use, low-maintenance package. When your list of outdoor cleanup chores seems a little overwhelming, take the easy way out with Stihl. Delivering 1,800 psi of water pressure to quickly and efficiently clean decks, driveways, sidewalks, and more, it comes standard with an adjustable flat-jet nozzle, rotary nozzle and a detergent sprayer to tackle a variety of jobs around the home and garden. A wide range of optional Stihl accessories make it ideal for also cleaning siding, automobiles and boats. Once you experience just how easy the RE 90 is to operate, taking the easy way out might not seem so bad after all. 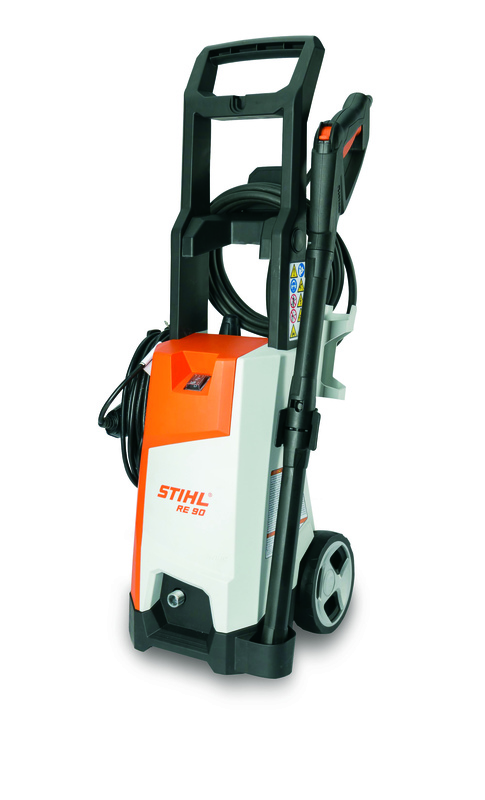 The convenient and lightweight Stihl RE 90 corded-electric pressure washer features a high-quality pump design, components, and accessories to provide the flexibility to clean just about any surface in a variety of cleaning tasks. Additional features of the RE 90 include: comfortable spray gun trigger that shuts off the 1.3 kW motor when the trigger is released and reactivates when the trigger is reengaged to maximize energy efficiency while cleaning. For optimized cleaning performance, a full range of optional accessories are available, including a rotary surface cleaner, foam nozzle, 50 ft. hose cassette and a 23 ft. extension hose. For more information, visit stihlusa.com.